The Sweet were the first band that I really ever followed and I kind of accidentally got there. My brother was a big fan of Fox on the Run and I heard it a couple of times without really getting it, then somehow I heard Hellraiser on the radio. It just hit me right between the eyes. There was something raw and urgent about Hellraiser that Fox didn’t have and I wanted to own that song. So, I bought a compilation album called Sweet Singles, which had four hits and a stack of B-sides on it. It was the B-sides that got me. The combination of Classic guitar riffs, crunching power chords and some outrageous vocal harmonies was like nothing Id ever heard. Songs like Burning, Rock & Roll Disgrace and Burn On the Flame became instant staples in my life. Sure, the hits were good – Ballroom Blitz is a great party song but it was largely those B-sides that just seemed to have more depth and honesty about them. I was hooked on all things Sweet and for a couple of years couldn’t get enough of them. I bought all their albums up until Give Us A Wink. By then, I’d discovered Ritchie Blackmore and as good as Sweet were, they couldn’t compete with the various outfits that Blackmore commanded over the years. For long time, the Sweet albums lay collecting dust in my record collection. Only recently have I bothered to go back and explore their music. To be honest, I’m surprised at how good some of it was. So, in the interests of nostalgia, I decided to list my top 10 Sweet songs. There aren’t many hits listed. In fact I think there are three at a stretch . I do like the hits, but honestly sampling Ballroon Blitz and Fox On the Run isn’t experiencing the Sweet. To get who they were and what they represented you have to take a deep dive into their music. Both are great songs and would sit comfortably in a top 20, but compared to some of the rockier, harder material where Andy Scott in particular can stretch out, they just don’t compare. Andy Scott claims this to be the best song that the songwriting duo of Chapman Chinn ever wrote. There certainly is more depth to this then most of the duo’s hits. The guitar work here is simultaneously restrained and impressive. The song had moderate chart success. From arguably the groups strongest album, yesterday’s rain has an almost sinister feel to it, with some grungy guitar work and some nice vocals from Connolly. Released after the band’s chart topping days, this single showcases the potential ambitions of the band. The song has all the attributes of a great rock anthem, but never got the airplay or recognition it deserved. I’ll argue till I’m blue in the face that songs with this intensity and structure earn the Sweet a seat at the table of hard rock heavyweights. The song has all the elements- dynamics. musicianship and attitude required. Perhaps influenced by Led Zeppelin’s Immigrant Song, Burning is a very heavy piece of music. Again there’s an almost sinister Gothic feel to the riff. Scott’s guitar work is top shelf. The song that started it all for me – a real in your face hard rocker with enough hooks to be a hit. Ozzy Osborne apparently thought it was the best single of 1973. Great riff. In my opinion, their best single by far. Heavy, with a great hook chorus and that dark undertone created by Cellos. There’s a lot packed into three and a bit minutes. I love this song – Andy Scott’s guitar work is brilliant here. It’s a riff rocker that was released on a B side in the band’s bubblegum period. This song would be at home on an album like Deep Purple’s Machine Head. Seriously underrated. Brilliant drumming, great guitar work, a driving beat bound together by some strong lead vocals and the usual clever use of four part harmony. This song showcases all that Sweet were and perhaps could have been. It has stadium rock written all over it. Ther e are two surviving members of the band. Sadly, vocalist Brian Connolly and drummer Mick Tucker have both passed away. 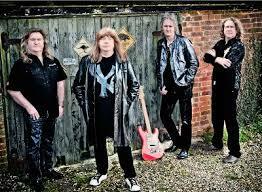 Bass player, Steve Priest lives in the States and still performs under the Sweet banner. Guitar player Andy Scott continues to tour and perform with his band Andy Scott’s Sweet.